It’s been a while since my last post, but with good reason. I’ve been sharing everything that I love about spirituality and life over on Thrive Global as a contributing writer. In case you haven’t been following my social media posts, for the past month I’ve been contributing to none other than THE Arianna Huffington’s (creator and Founder of The Huffington Post) newest content platform, which is based on her 2014 Bestselling book Thrive: The Third Metric to Redefining Success and Creating a Life of Well-Being, Wisdom, and Wonder. Talk about a DREAM COME TRUE!!! In addition, I’ve been discovering new ways to promote my new book I Want It All: A Vision Book Journal For Manifesting Dreams. I use the word discover because, as a newly self-published author, I’ve taken the initiative to learn everything about self-publishing on my own. Let me just tell you, I’m having an amazing time with this process because it’s truly a vision manifested! It’s both challenging and rewarding at the same time, but I do plan to build a team in the near future to help take the movement to the next level because I know that I can’t do everything without the help of amazing people who believe in my vision as well. Which brings me to why you are reading this post… This Saturday, April 22, 2017 at 11:00 a.m., I am going LIVE on Facebook to host my very first LIVE Vision Party!!! If you are not already a member of my email list, you should join it right away because everything that I will discuss during the vision party is based on content from my book, and there will be a free download for each day this week to help you prepare. Since the party is based on my vision book journal, I want to extend this vision party to everyone who is a member of the I Want It All Mastermind Group, whether you own a vision book journal or not (but you totally should get one anyway!). To join this exclusive group, simply like I Want It All Vision Book Facebook Page and you will be extended an invitation to the group. Additional perks of joining this group are that you will be in good company of other FABULOUS dreamers and strivers who will serve as a great support system for your vision, as well as a place to share resources and expertise amongst one another. I’m so excited about this party! It’s my first, and it won’t be the last. The goal is to use these LIVE parties as a stepping stone that leads to a vision book party tour. Skies the limit in this next chapter of my journey. I’m dreaming big, I’m thinking bigger, I’m willing to do the work, and I want you to join me on this amazing journey of unfolding! So what do you say? See you Saturday? This week’s theme has been all about overcoming the idea or failure and mistakes and seeing life as a series of lessons. If you are on Daily Fab + Inspo list, then you’ve been reading my breakdown on why I don’t believe in failure or mistakes. If not, I’ll get you all caught up in a snapshot, but you should definitely sign up because the transformation is all in the details. For starters, I believe that sometimes we use failure as an excuse to quit and give up on ourselves. Just because you don’t get the outcome that you want, doesn’t mean you won’t ever succeed. Some of the most famous names in history would never be known today had they given up on themselves at the first sign of defeat. Michael Jordan, Thomas Edison, the Wright brothers… Beyoncé for goodness sake! Each of these people, and countless others, never labeled themselves as failures because they didn’t get it right the first time. Instead, they let those temporary moments of defeat fuel them to keep going, keep working, keep practicing to hone their craft. And every day that would go by, they were getting better and better with time. Today, we know these people as some of the greatest of all time. But by no means are they super human. They just chose to see experiences differently. They chose to see them as opportunities to be better. You know the saying, “Nobody’s perfect,” or “Everybody makes mistakes?” Well it’s true and that’s what makes life awesome! If we didn’t make mistakes, we wouldn’t know what we need to do to improve ourselves. Mistakes are also opportunities to do and be better. We get to use the things that we didn’t get right, and make better choices moving forward. Choosing a different thought and corresponding action is what will render a different outcome than the one before. 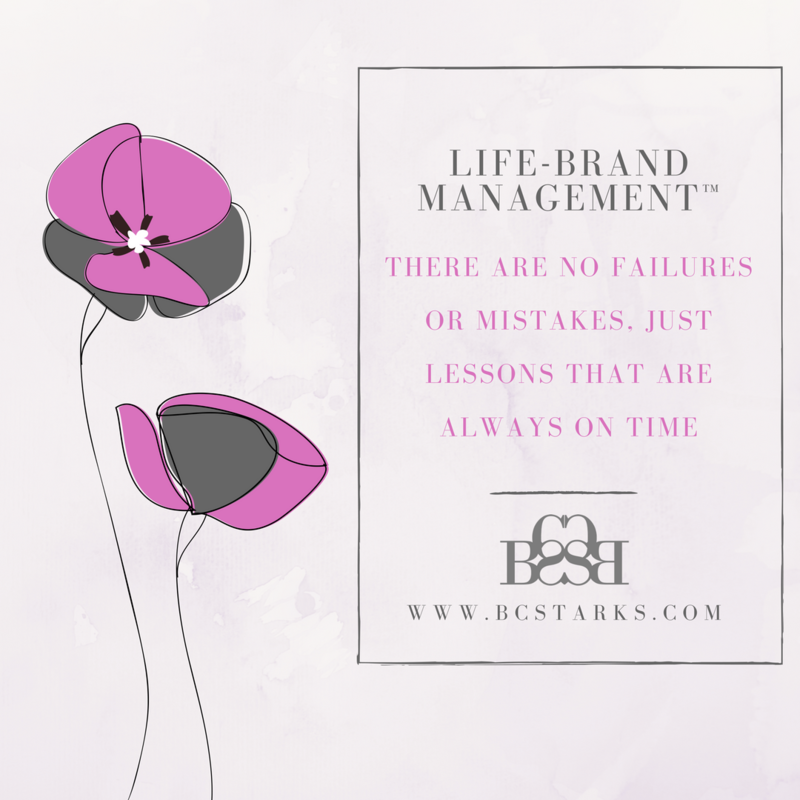 Oftentimes the very thing that makes us label ourselves “failures” or see mistakes as anything other than lessons is the whole idea of a time delay. 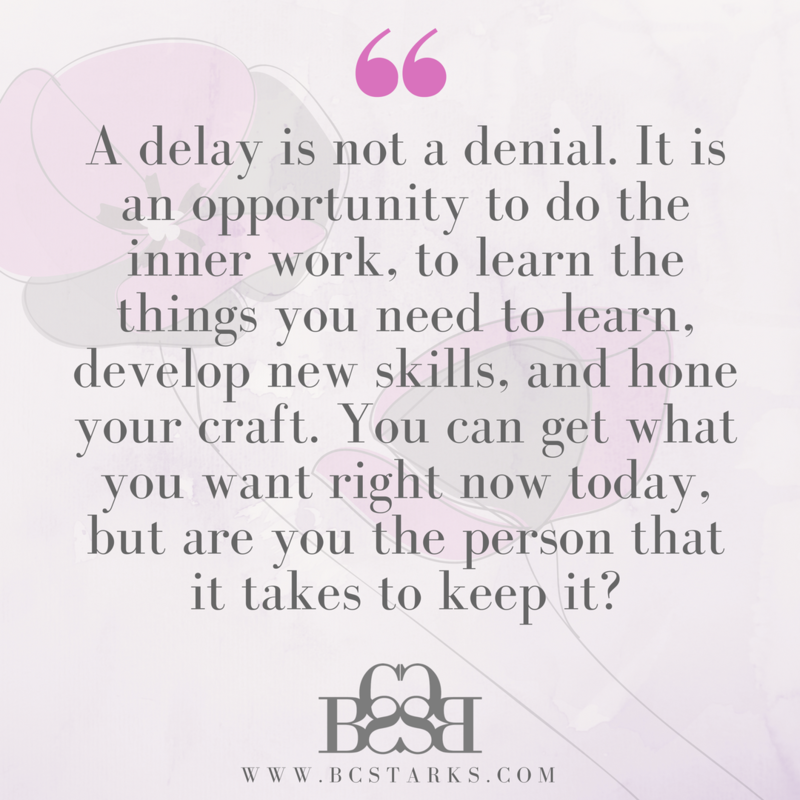 A delay is often the very thing that is needed to prepare you for the life of your dreams. If your dream life would come any sooner than it should, you probably wouldn’t enjoy it because you wouldn’t feel prepared to handle it. Hence the reason why people who win the lottery often lose it all in a short period of time. Or the reason why people who experience overnight fame, often fall into depression. Use the experiences of your life as a tool to learn and grow from. They are there to teach you something, to allow you to become more, to do more, and to achieve more. And if you use your time wisely, you could become the very person that it will take, not only to get the life you want, but to keep it. If you can relate, let me just say that you are not alone. So many us subconsciously sabotage our own goodness by focusing on the things we don’t want or like about our life experiences. But if you know a thing or two about the Law of Attraction, then you know that it does not discriminate against the things that you focus on. This means that even when you are focused on something that you do not wish to happen, you can subconsciously be drawing it into your experience. Yes, YOU could be attracting the very things that you resist. And what you resist, persist. This means that pushing against something that you do not like, isn’t what’s going to make it go away. In fact, that only amplifies more of what you don’t want. The Law of Attraction also works in the same way as the law of gravity and motion combined. Example: When you push up against something that you do not want with intense energy, it pushes back at you with the same force. Or if you toss something up in the air with strong force, it will build that same momentum as it comes back down. Likewise, Law of Attraction says that what you focus your attention on most, you get back in the form of more experiences that will match that same frequency or feeling. According to Abraham & Esther Hicks, world-renowned teachers of Law of Attraction, the way that you feel is a HUGE DEAL! Your feelings matter because they serve as your internal compass, letting you know what your point of attraction is in any given moment. When you feel bad, you are emitting a particular energy that can only come back to you in the same way that it left; leaving you with more things to feel bad about. When you feel good, the same thing happens. That good feeling energy is returned to you, just as you sent it out into the world, bringing in more things to feel good about. But the beauty of it all is that you can always shift your point of attraction by finding something that makes you feel better to focus on. Think about your loving pet, or your #WCW or #MCM… how does that make you feel? Good, right? Well, whatever it takes, do it, and do it often! Because when you are looking to make positive changes, there is no way to do that if your attention is stuck on how bad things are. If you are part of my email list, then you know how much I sing the praises of author and founder of Hay House Publishing, Louise Hay for her positive contributions to the world of metaphysics and spirituality. And if you are familiar with the term “positive affirmations,”then you probably know it because of her and the popularity of her 1980’s Bestseller You Can Heal Your Life. This book marked the beginning of my life being changed, and if this is your first time hearing of it, I’m sure it will do the same for you. Check out this video of the movie You Can Heal Your Life, which is based on the book. If you like what you’ve read so far, then JOIN THE LIST! You’ll get Daily FAB + Inspo sent to your inbox. Don’t worry about spam, I’ll never do it! The conversation continues on my other social media platforms, so join me over on Instagram, SnapChat, and Facebook (@BCSTARKS). And don’t forget to leave a comment below. I want to hear from you! What if this life you are living is playing out in order for something greater to come out of it? What if even the most horrible thing that could have happened to you, did not happen in vain? I know, I know… Hear me out. What if, the very idea that you survived and came out on the other side is what someone else needs to know to keep them from jumping off the deep end? What if another life depends on your lessons, healing and growth? What if I told you that you owe it to yourself and the world to learn, heal, and grow from those experiences? What if all of this were true? This statement could not be more true! In fact, this was the very idea that kept me from being a college drop-out. Not that I have anything against dropping out of school, I get that it’s not for everyone. In my family, I was the first person to graduate college. While I was in school, I remember wanting to quit so many times because I just didn’t feel like it was where I belonged. But then I would have a conversation with my little brother, or a younger cousin who was planning their future, and we would discuss things about school. They were so excited about the school I attended at the time (University of Miami) and they would light up with pride in what I was doing. I even had relatives asking for advice on how to enroll in some kind of educational program because they wanted to give themselves more options. That’s when I knew that even something as simple as my choice to go to college had a bigger impact on others then I realized. That’s when I knew that my journey was not just my own. And while I might have been the first college graduate in my family, I am definitely not the last. We are all teachers of our own experience. Sometimes the things we go through are for us to learn the lessons and then go and teach another so that one less person has to suffer in order to grow. Never think that what you experience is in vain. Your growth matters. You matter. And there’s always a bigger picture. If you could think of one thing along your journey that you’ve experienced for a purpose greater than you, what would it be? What was the lesson that you learned? How did your lesson or experience help others? I want to know your story. Comment below or shoot me an email at brittnay@bcstarkspr.com. P.S.- Join the list to receive my daily FAB + Inspo newsletter in your inbox. Don’t worry about spam, I’ll never do it! Just click here!